Interactive Notebooks are a fun and creative way to practice daily skills and help to solidify new skills introduced. Students always have access to it and it makes a great reference tool. Students will be able to take complete ownership of their work and it helps to engage students in their learning. This beginner’s interactive notebook is a great tool to use when you are first starting out. It includes 2 different flap types and is super simple. There are a few different covers to choose from and what is best about this book is you create it from Construction paper and regular printer paper. No need to waste a whole composition notebook especially if you are not sold on the idea of INB. I typically make the books prior to the lesson to save time. 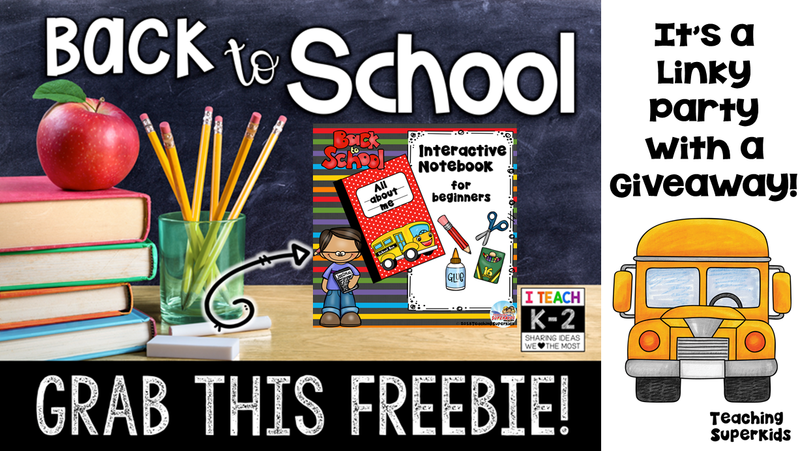 This freebie is perfect for Back to school. Get to know your students as they share some of information with you. It is a perfect way to keep students engaged and busy while you are assessing other students. It includes activities for name, age, grade level, likes, new friends, and so much more. You can use the completed books for the students to get to know one another as well. Let them exchange books to read about what others in the class like! I hope you enjoy this freebie and don’t forget to enter to win below! What a great way to introduce INBs! Thanks for sharing! Thanks for the freebie of your INB! So cute! What cute INBs! Thanks for sharing!